A standby generator installation require planning before the project can start. There is a lot of information that needs to be processed just to get to the point where you can choose an unit. As we consider the installation process, we need to take into account home or building size, type and size of load, zoning restrictions for your area, restrictions placed on your property by Home Owner Associations, flood zones, fire Marshall requirements, as well as building, plumbing, and electrical inspector requirements for installations. As you can see there are a lot of issues your technician needs to manage in order to provide you with a quality trouble free installation. 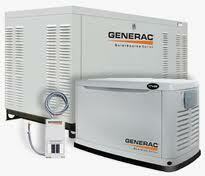 Here are some general procedures for standby generator installation. After you filled a Generator Consultation Form, and a Generator Load Calculation Form a technician will visit with you to do an on site evaluation. During this visit will learn more about the geography and topology of your property, and the electrical characteristics of your home or building. Armed with this information, plus your load calculation he will have a better understanding in terms of what is the best equipment for you. The technician then sits down with you and learns about your objectives or reasons for buying a generator. As he does this, he will be analyzing whether you will be best served by a whole house application, or an essential circuit one. He will then match the load calculation he has done previously for you, with a generator that would provide enough power to feed your demand. He will later pair this generator with a transfer switch that will be compatible with your existing electrical service characteristics. The technician then surveys your property to learn what is the most optimal location for the installation site of your generator. Generally the most optimal position for a generator, in term of your budget, is near the electrical services equipment, and near the fuel source. Once he has found this location he communicates this to you, and on your approval of this location, he proceeds to draw his installation plans. He draws a site plan, a service riser drawing, a one line diagram, and a layout of how the new equipment will be positioned within your property. After this is done he will give you the amount that he needs to accomplish this installation for you. If you are in agreement with the scope and price for the project, the technician will then draw a proposal for you. This proposal indicates the scope of work, the prices, and the method of payment. Normally, there is a down payment required at the time when you sign the proposal, and two other payments that are due as your project completes. Take time to understand what is written in this proposal, and ask questions should you find an area that needs clarification. Home Owner Associations have rules that owners must comply with. If you belong to one, we ask that you request and secure approval from your HOA before proceeding with the installation process. If your installation requires permitting, we apply and secure all permitting before starting any work. Some municipalities require several permits for generator installation, including electrical, structural, and plumbing. Some cities and counties are now requiring engineering drawings depicting the exact position of generator, specifications of unit and its transfer switch, and other pertinent information. We have the capability to submit these types of drawings to all the municipalities that are requesting these forms of submissions. Permits for generators may be issued the same day you apply for them. In some cities and municipalities, it may take several days before they issue the permit. Depending on the time or season, generators can take several days, to several weeks to arrive from the manufacturer. In a year of heavy storm activity, it may take longer to receive an unit. This takes just several days during a season of low storm activity. On the average it takes two weeks to receive the unit from the manufacturer. Sometimes is a good idea to wait until the permit is secure before ordering the generator. There has been instances where the authorities have not approved an installation of a generator due to size, zoning, or structural restrictions. When this happens, a permit is not issued and the installation can not go forward until the authority's requirements have been met. We advise to wait until the permit is released before ordering the generator so that if there is a negative outcome from the permitting office, we don't have to pay restocking fees to return the generator. After all permits are secured, and the generator has arrived, we proceed to set the generator base, set the generator on its base and start the wiring process. The transfer switch is installed and wired, and we modify the existing electrical service to accept the generator as second source of energy. Your standby generator installation needs fuel to operate its engine. Normally we connect this unit to your existing natural gas line. If you have a propane tank rather than natural gas line, we make a connection to it. Generators can work with either propane or natural gas. If you don't have either of these fuel sources, we will coordinate an installation of a new propane tank for your generator. After your standby generator has been installed, wired, and piped in, we call for final inspection. When all inspection is passed, your generator is turned on for service. After your standby generator installation is completed, and your unit is placed in service, we submit all warranty registration to the manufacturer and train you so that you know how to operate your standby generator. Note: These are average prices only. Your installation may have higher or lower prices.